That Wide Steel End Frame On Your Room Divider Rocks! Sturdy and Stable Room Dividers! When buying a room divider, sturdy and stable is must! 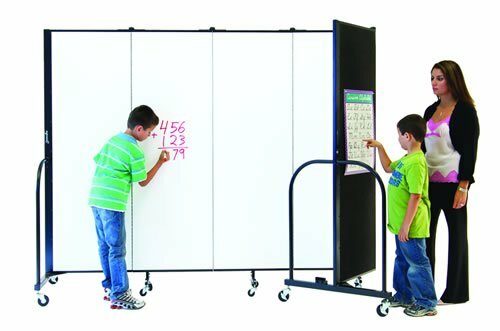 A wonderfully sleek and beautiful design as well as portable, practical and durable is what you will find with a Screenflex Portable Wall. Whether you are looking for a room divider for your church, school or office, safety is probably on the top of your priority list. This is why Screenflex builds a wide and very sturdy, steel end frame on all FREEstanding Room Dividers. Take a look at this video that describes how and why we build sturdy and stable room dividers. You can see that a wide end frame means you’ll have a safe and stable divider. Setting up dividers are easy when you have a clear sight of vision. Roll your dividers right into place and set up in seconds. No need to keep panels bent for support, straight, curved, “L” shaped, your divider will be safe and sturdy in any position. Wide end frames provide support to your dividers so if you need a long privacy wall for crowd control, attach one or several dividers together for a project of any length. Just connect the multi-unit connectors together which will lock your dividers together for even more privacy. Even if you have to create a turn in your wall, no problem, panels bend to create many shapes. Your end frames are not only made to create a sturdy and stable room divider. Wide end frames fit comfortably in your hand and are positioned at a convenient height so you can pull or push your closed divider anywhere it needs to go with ease. Our patented end frame completes our sleek, sturdy, safe, flexible and convenient portable room divider perfect for any room that needs division.